"His clothes were tattered, and we wanted to help him with some money to buy new clothes, but he denied our charity. "After we persisted, the boy asked us for books for his education, which we bought for him from a nearby shop. Inspired by a boy of his age, Anand's life changed." 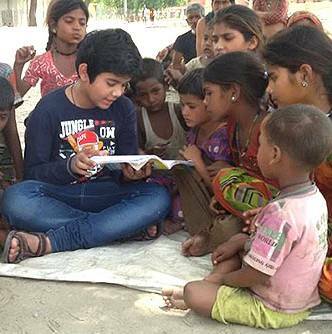 Today Anand Kumar Mishra, a Class 6 student is educating and empowering hundreds of slum kids in and around Lucknow. 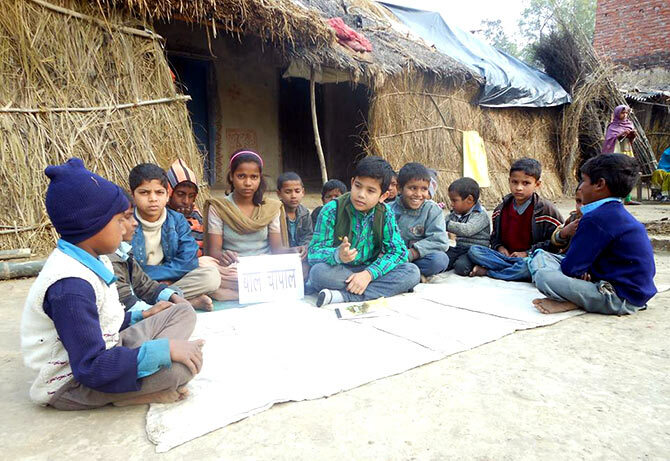 At an age when most of his classmates spend their time watching cartoons, playing video games, and preparing for exams, 11-year-old Anand Krishna Mishra is busy teaching underprivileged kids. 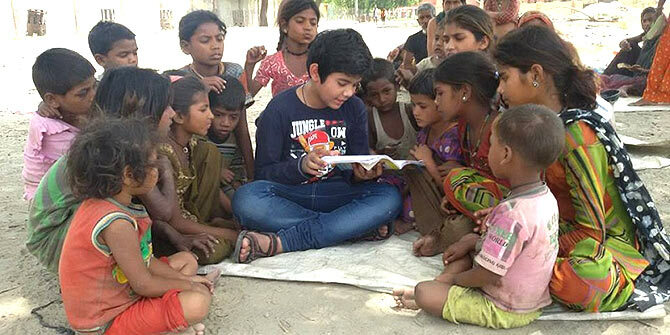 Currently studying in Class 6 in Lucknow, this 'chhota masterji' has reached out to children from slums and over 125 villages around the city and organised his 'Bal Choupals'. His Bal Choupals started in the year 2012, when Anand had the opportunity to spend time with a few children living in a slum. He was sharing with them all that he learnt at school. Soon this initiative took the shape of a gathering, where he started educating these children. Taking an hour out of his daily schedule and sharing his bit is just one side of the coin, but it was his vision and sheer consistency which has today started taking shape as a larger-than-life movement. Today, he teaches mathematics, computers and English to these children, and has inspired over 700 children to get enrolled in schools. In the process of teaching poor children, Anand gets the opportunity to dig deeper into their lives, and takes help from his parents to make their families aware of the need to educate their children. Anand's parents Anoop and Rina Mishra are both employed in the UP police and are supportive of the mission Anand has taken up. The popularity they garnered also helped them organise sessions on environmental awareness, where people come together and organise afforestation drives. Anoop tells us, "When Anand was in class 4, we had visited Maharashtra during his holidays and saw a kid sitting in a corner and studying. "Every time the prayers started in the temple, he ran inside and led the singing group. "After the prayers ended, he went back to his place under the dim lights and continued with his reading. After coming back from the trip, Anand's parents took him to villages around Lucknow. They saw many kids who are devoid of education and spending their time doing household chores or working as child labourers. They were able to convince some kids to study with Anand. Gradually with time, these kids started bringing their friends along. Bal Choupal was formed. 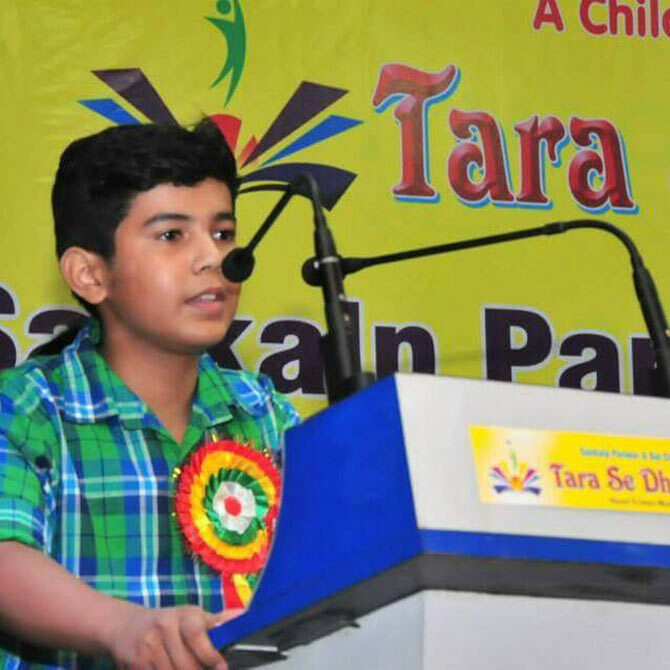 Anand studies in City Montessori School in Lucknow. After coming back from his school every day, he takes some time to rest in the afternoon. At five in the evening, he goes for his Bal Choupal. When asked about his methods of teaching, Anand says, "I try to teach my friends in a friendly manner. Sharing interesting stories and organising games for them are some of the ways to make learning fun. "I try to make sure that they don't get bored. Some of these kids don't like the way they are taught in school just because it is boring. This is also the reason some, even after being enrolled, don't go to school regularly." The learning imparted by Anand in his Bal Choupal is not just restricted to books. He gives them lessons on morality too. Anand has received many awards for the work he has been doing, including Satyapath Bal Ratan award and Seva Ratna award. With help from local people, Anand has been trying to start local libraries at different places in and around the city. He has been successful in starting a few libraries in nearby villages. Anand is trying to get help from other privileged and educated children to join the cause and help the students of Bal Choupal. Anand teaches 100 kids daily who come to his gathering from their villages and slums. His efforts suffer during exams, but his friends pitch in for help. Anand is proud that his friends never disappoint him and their Bal Choupal continues to grow. This year, during Teachers Day, Anand and his parents have started a 'Chalo Padho Abhiyan' where they are inviting the educated members of the society to support the education of at least one child. Along similar lines, they have also started a programme 'Chalo Bahan, School Chalo' (Come sister, let's go to school) which is specifically for girls from poor families. The programme has been launched on the event of Navratri. This little boy smiles with confidence when he says that with small steps like these, India will soon become an educated and prosperous country. Why is this designer painting taxis?